Rooibus teas are made from a red bush that grows in South Africa and thus are called "Red Teas." 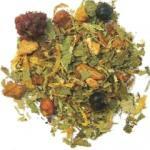 Not all Rooibus teas are red, however, and are commonly used with herbal infusions. That is why you will notice we have a wide variety of flavors and combinations. Rooibus teas make great iced teas as well.